OEM Replacement or Custom Design Edges, Weld in Bucket Base Edges, Underground Loader Edges, Wide Range of Teeth and Adapters, Cast Half Arrow Edges and Segments, Bolt on Top Cover Plates, Corner and Side Bar Protectors, Half Arrow Edges with or without holes, Bolt on and Weld on Wear Plates. Weld-on Heel Shrouds protect high wear and impact locations on a bucket, protecting the equipment. 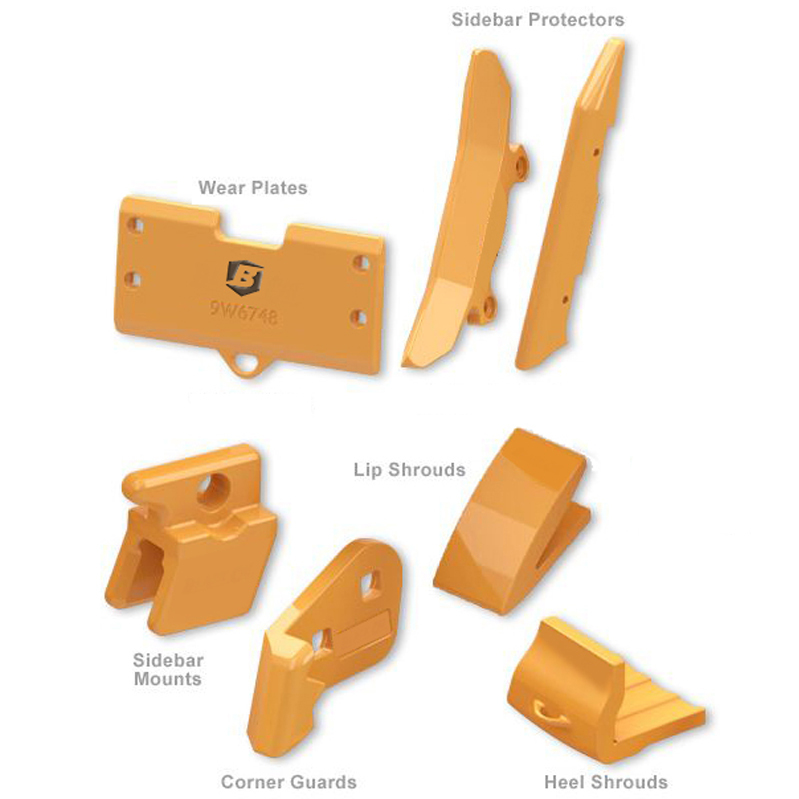 Corner Protectors protect high-impact locations of the bucket, extending life of the bucket. Black Cat Cast Alloy Lip Shrouds provide maximum wear and protection for the bucket lips. Sidebar Protectors mount to the sides of the bucket. 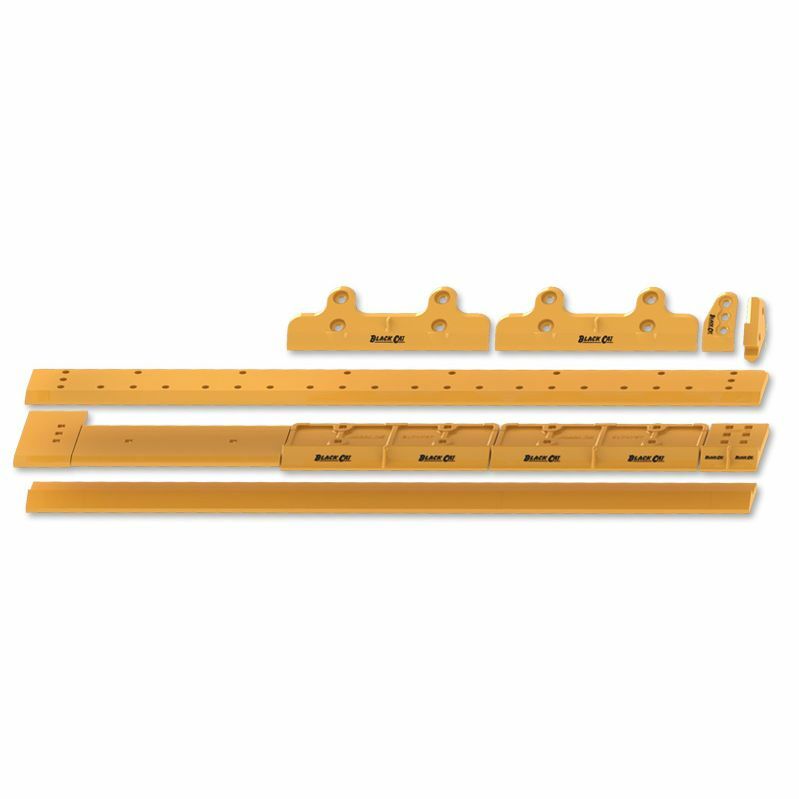 Adapter plates and shroud extensions are available. 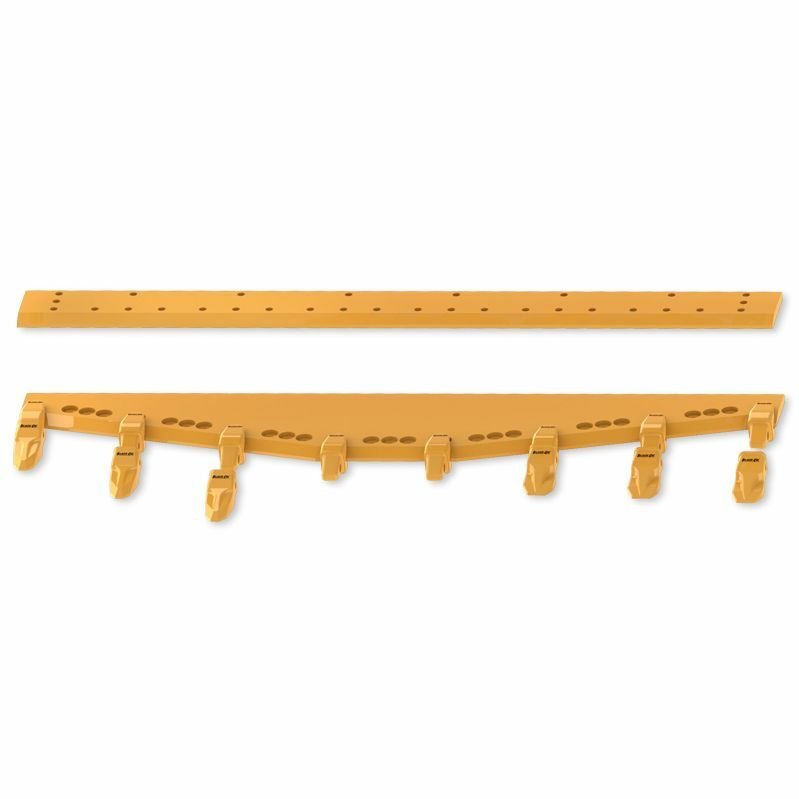 Mounted Wear Plates provide extra protection to the bucket wall. Black Cat half arrow edges and segments are designed and built to perform using our HighSpec Alloy X14 steel for excellent wear characteristics and superior impact resistance. Half Arrow Edges are used to replace the standard double bevel design commonly used on loaders when no tooth and adapter options are installed. Segments are placed between loader teeth to protect the base edge of the bucket. The half arrow design offers enhanced protection for the edge and bevel. Combining half arrow shaped segments or blades with Black Cat base edge covers completely protects the base edge from abrasion. 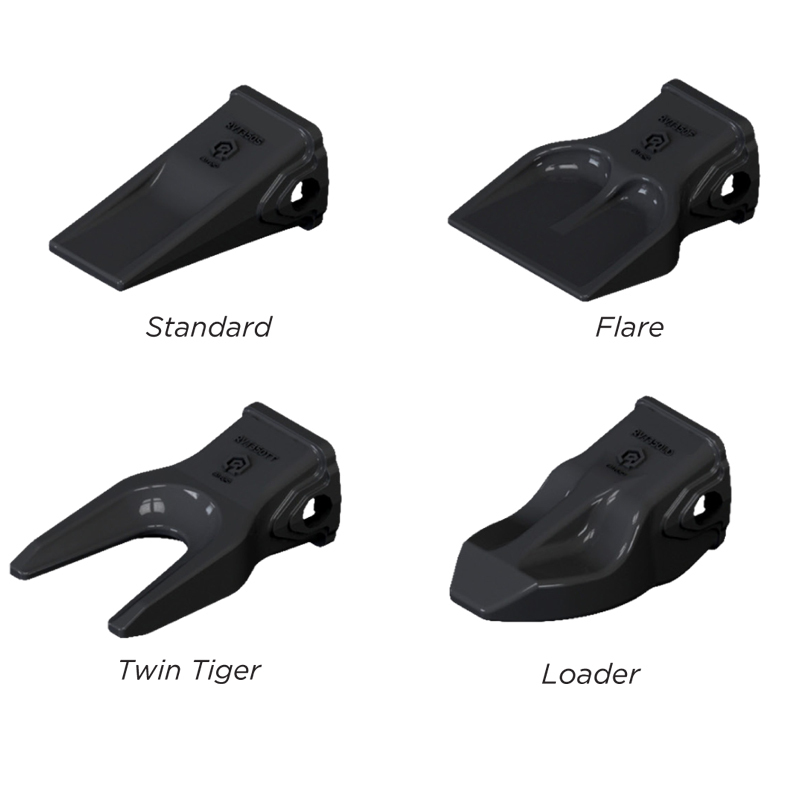 Black Cat’s Half Arrow designs offer the benefits of more material in the high-wear areas, increased bucket capacity, and enhanced bucket penetration. Maximum depth countersinking allows for optimum use of wear material before the bolt head’s failure. 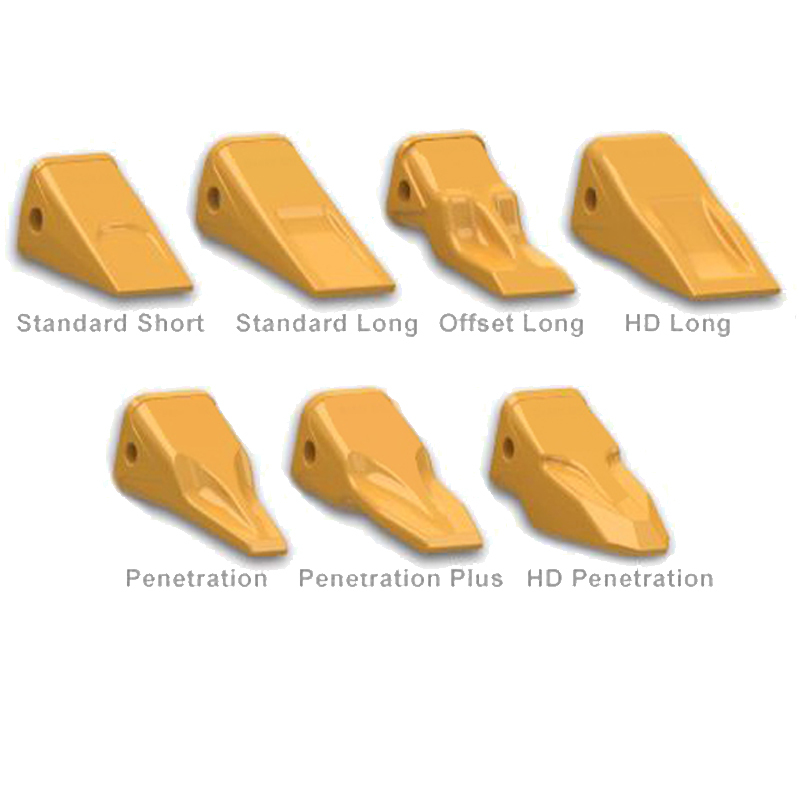 The sharpened nose design offers excellent penetration capability and enhanced material flow into the bucket. The combination of half arrow blades and base edge covers protects the base edge while optimizing the flow of material into and out of the bucket. Black Cat’s unique design puts more wear material where it is needed most, on the underside of the blades where abrasion is highest. Loaders are the most varied product we offer. Each equipment manufacturer has its own system and spacing, with spacing varying for different sized models across a given manufacturers offering. This means edges are unique for almost each and every manufacturer and model. Bolt on loader edges and segments have the most options available and are some of our most often customized products. Because there is very little interference on the bottom of a bucket, there is an almost endless possibility for customizations. Straight bucket systems offer great flexibility and are designed to accept either bolt on edges or teeth and segments. Bases edges are drilled so that machines can quickly be converted from one system to the other without any welding. 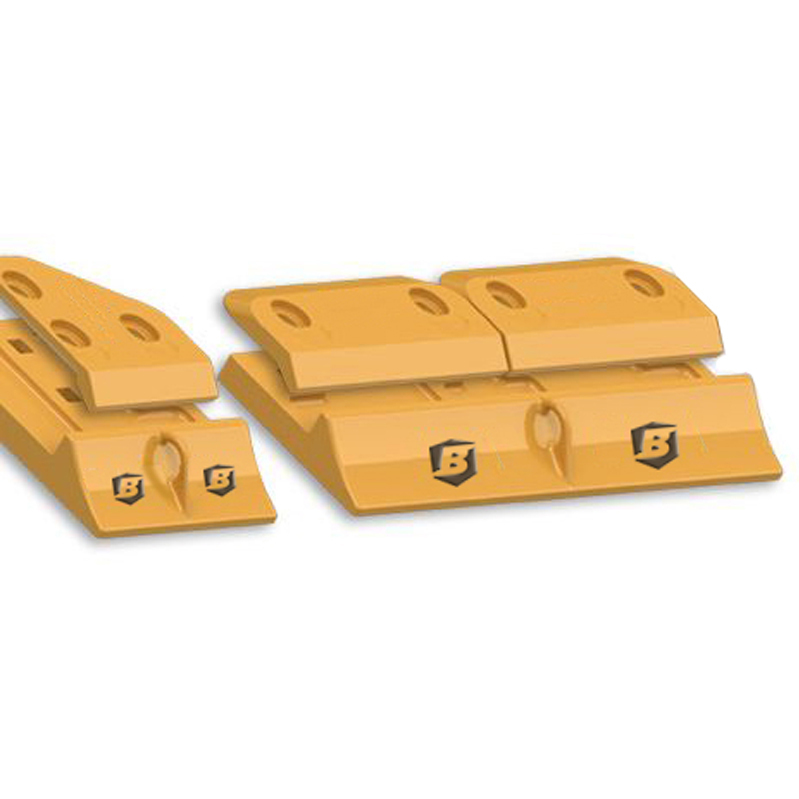 Bolt on edge systems offer maximum protection for the base edge and are ideal for applications where penetration is not an issue. They also maintain a smooth, clean floor and increase bucket capacity. Bolt on edges are easily replaced and can be reversed (or propellered) once the useable life of the first edge has been reached. Black Cat direct replacement teeth and adapters are manufactured using our HighSpec Alloy steel and heat treated to our precise specifications. Computer design and analysis is employed in the development stages to ensure proper fitment and optimum strength for every part. Efficient processes and state-of-the-art foundry practices allow for competitive pricing of quality parts. Our teeth and adapters come in a variety of different styles to best suit your needs and machine type. We also offer hardware, pins, and locks and cast backhoe lips. Hammerless pin for safe and easy installation! Copyright © 2019 Black Cat Wear Parts. All Rights Reserved.